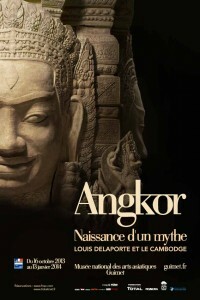 Angkor: Birth of a Myth – Louis Delaporte and Cambodia, exhibition. This exhibition addresses the rediscovery of Angkor monuments and Cambodian heritage in the light of works and original documents gathered by the great French explorer Louis Delaporte (1842-1925) – original sculptures, drawings, watercolours, old photographs, casts etc. For the first time since 1925, impressive examples of sculptures and bas reliefs moulded in the late 19th century, once exhibited in the galleries of the Indochinese Museum in Trocadero are on show following complete restoration. 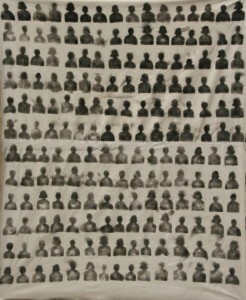 A gaze is focused on these expeditions which occurred in the grand era of universal and colonial exhibitions. Exhibition : Art Facing the extreme, Spring 2013. Exhibition in New York, Art Facing the Extreme, Spring 2013. Screening, Cinéma L’Entrepôt, Paris, 2012. « A la recherche du Soleil » de Werner Schroeter (1985). 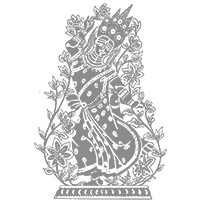 Un documentary about Ariane Mnouchkin’s work. 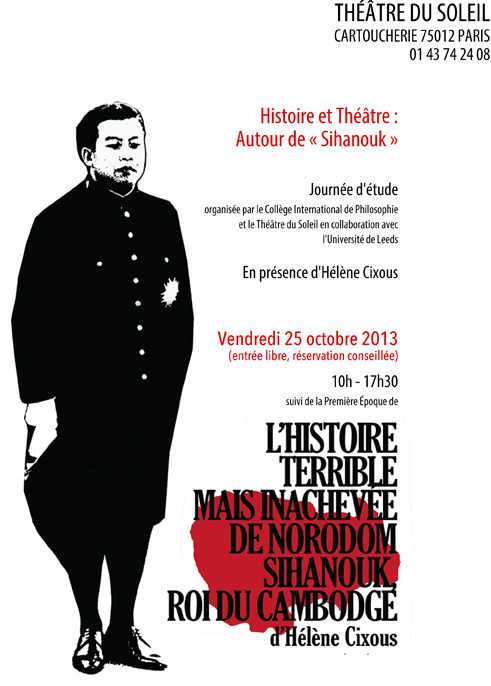 At the center, Hélène Cixous’s play : L’Histoire tragique mais inachevée de Norodom Sihanouk, roi du Cambodge..
Débat : 25 years later, in 2011, The play is performed by Khmer actors at the Cartoucherie. A great human and artistic adventure. With Georges Bigot et Delphine Cottu, directors. press review of the conference. 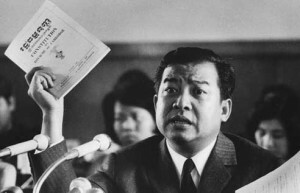 Publishing of the book “Cambodge. Le génocide effacé.” Under the direction of Pierre Bayard et Soko Phay-Vakalis, éditions Cécile Defaut, Nantes, 2013. 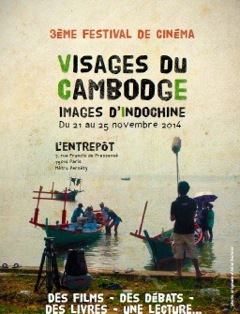 Trilingual publishing (french/English/khmer) of the Art Book “Cambodge, l’atelier de la mémoire”. 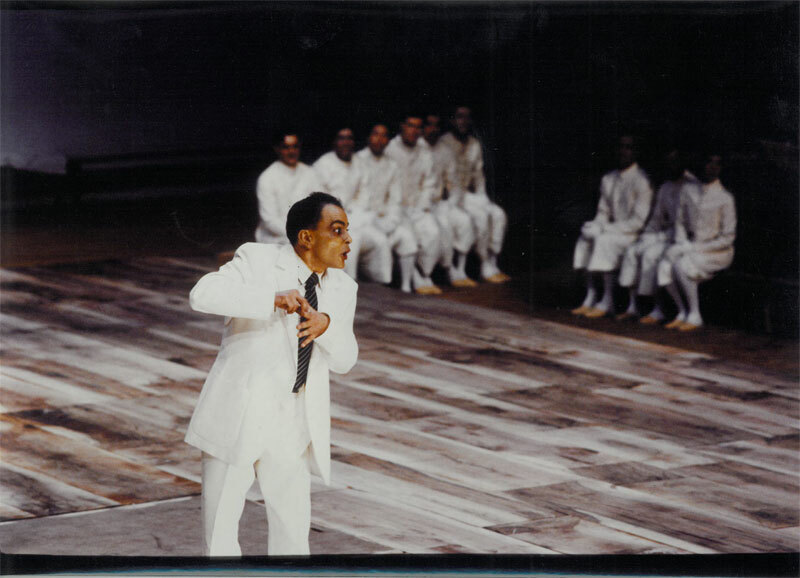 Preface by Rithy Panh and Agnès Sénémaud, postface by Ashley Thompson and texts by Soko Phay-Vakalis, Pierre Bayard, Richard Rechtman. Interview with Vann Nath and Séra by Anne-Laure Porée. Co-edited by the centre de ressources audiovisuelles Bophana, Université Paris 8 and les éditions Sonleuk Thmey, march 2010. With a trilingual DVD (french/English/khmer) directed and produced by Bophana Production and le Centre de ressource audiovisuelles Bophana, including a documentary by Guillaume Suon Petit, and a bonus. Forum des Images, Paris, January 2011. Focus ‘Cambodia’ in the International Film Festival Un état du monde et du cinéma: Roundtable discussion ‘The Image resisting Erasure’, with Hélène Cixous, Vann Nath, Ashley Thompson, Pierre Bayard and Soko Phay-Vakalis. Pompidou Centre, Paris, December 2010. Post-screening discussion with Hélène Cixous and Georges Bigot, on Bernard Schroeter’s ‘A la recherche du Soleil’ and the contemporary Cambodian staging of L’Histoire terrible mais inachevée de Nordom Sihanouk, roi du Cambodge, at a Schroeter retrospective. Mémoire, Archive, Creation exhibition opening, 2010. French Cultural Centre, Battambang, Cambodia, January 2010. Mémoire, Archive, Creation exhibition opening. Roundtable with Vann Nath, Ashley Thompson, George Bigot, Delphine Cottu, Horn Sophea on art and the difficult memory of genocide in contemporary Cambodia.